SpeakerCraft TIME One speakers stay hidden in your ceiling until you need them; as soon as you touch a button on their infrared remote control, a robotically controlled speaker ballet begins. It's the Theater In Motion Experience, or TIME, giving you the pleasure of goofing around with servo-controlled speakers while at the same time pleasing that beloved member of your household who really wants to hide all evidence of technology. Push that button and down they descend, letting you tilt them at 15°, 30° or 45° angles until they are pointing right at you, wherever you're sitting. This is some pretty sophisticated technology nestled within these wife-friendly speakers. The 11.6-inch circular flush-mounted units are matched up for identical sound, and inside each is an 8-inch Kevlar cone woofer along with a 1-inch aluminum/magnesium dome tweeter. They're connected to their central control unit with Cat5 cable, and the makers leave it up to you to choose your own thunder-pumping subwoofer. Once you have them aimed exactly where you like them, you can save that setting, and then each time the speakers are activated, they descend and move to your preset positions. But then, we would rather just play around with them a lot every time we turn them on, given they're so essentially robotlike and tweakable. That might even be more fun than listening to them. But wait a second here. Because midrange and high frequency sounds are so directional, wouldn't the sounds seem like they were all coming from the wrong places? 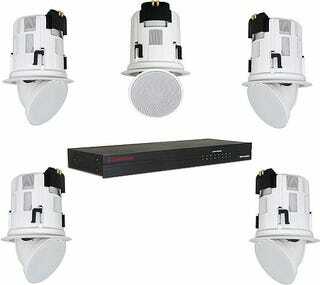 For a home theater setup, for example, it might sound like the actors' voices are emanating from the ceiling. That could be major weird. To discover whether this really is a detriment would require a complicated installation. What if you don't like them once they're already installed? Well, that'll cost you a bundle, that's what. Big uh-oh, especially if you've installed them in an existing room. And that's on top of the $2,000 price you'll pay for these five speakers and their control unit, and that doesn't include the subwoofer or any amplification whatsoever. Go ahead, audiophiles, turn up your noses. Except for that descending and robotically controlled thing, our noses are starting to at least point north.